Do you want to see INF’s incredible work firsthand, experience the beauty of Nepal, and be challenged & encouraged in faith, hope and love? Join us on a two-week vision trip or fundraising trek for a life-changing experience. WHO FOR: Open to all and particularly suited for HSC and university students. Older trekkers are most welcome, with options for trekking in two groups if there are a large number of participants. 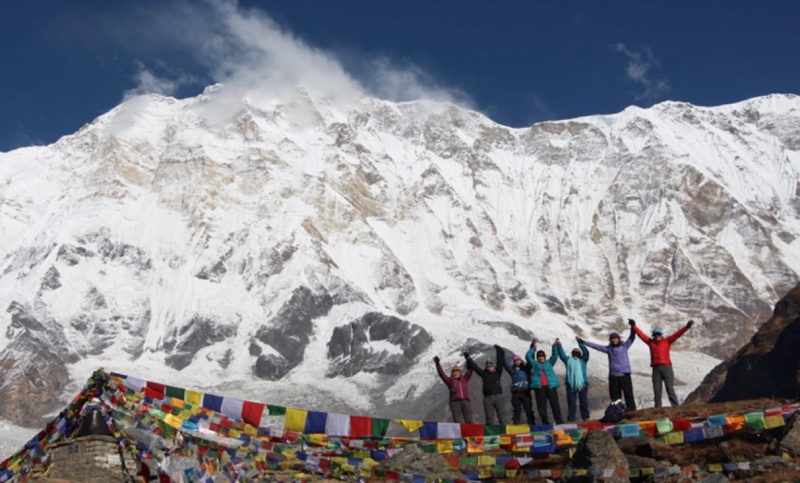 Nine days of trekking through the breathtakingly beautiful Annapurna mountain range to Annapurna Base Camp (4130m) plus visits to cultural and tourist attractions in Kathmandu and Pokhara. Trek participants raise funds (on top of trek costs) for Green Pastures Hospital’s work treating and rehabilitating people with spinal cord injuries and leprosy. A chance to see the life-saving and life-transforming work of International Nepal Fellowship (INF) among poor & disadvantaged people and communities and to volunteer alongside former patients at Green Pastures Hospital farm. Receive greater understanding, renew your mind and perspective & refresh your relationship with God and your global neighbours as you learn from Nepali Christians, INF’s passionate staff and volunteers, and the communities which grapple each day with poverty and injustice. See INF’s transformational work with poor and disaster-affected communities, with mothers and children and with people with disabilities. Opportunities for optional village home stay with Nepalese families and half-day volunteering alongside former patients at Green Pastures Hospital farm. Time to revel in the natural beauty and majesty of Nepal as well as the warmth and hospitality of Nepalese culture and visit significant historic sites in the Kathmandu Valley and around Nepal. Generally, trips cost around $1800-$2000, excluding international flights. This covers daily living expenses, internal transport and accommodation. When do you normally run trips and who are they for? We aim to run one Vision Trip each year in either January or October/November. The January trip is geared towards students, younger adults, and can include families with children over the age of 10. The October/November trip is open to all, including older participants. We run our annual fundraising trek in October for anyone interested. How fit do I need to be to go on a trek? While you do need a level of fitness, you don’t need to be an athlete! INF will provide a suggested training program to help you increase your fitness. How much money do I have to raise to go on the trek? You don’t have to raise a certain amount to be able to participate. We will provide you with online and offline tools to inspire people to give generously, so that you can raise as much as you are able to for our life-changing work.